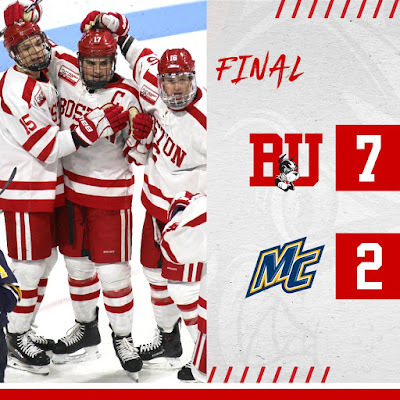 The Terrier Hockey Fan Blog: Power play goals rocket BU past Merrimack; Cloonan scores! Merrimack drew first blood at 8:50 of the first period when Chase Gresock took a clean win of a draw and fired a shot from the top of the left circle past a screened Jake Oettinger. Six minutes later with BU on the power play, Farrance connected on a center point slapper with both Curry and Ty Amonte screening Craig Pantano. Harper and Curry picked up assists.